The acclaimed choir of St Anne’s Cathedral, Belfast, will sing in a free concert in Banbridge Non-Subscribing Presbyterian Church tomorrow (Wednesday) in celebration of the 300th anniversary of the founding of the church. A warm welcome is extended to anyone who would like to join the Minister, the Rev Norman Hutton, the session, committee and congregation for what promises to be a beautiful evening of Christmas music. The choir, which will comprise the St Anne’s Girls’ Choir and Lay Clerks, will be coming to Banbridge direct from Belfast Cathedral, where there is a Choral Service at 5.30pm six days a week. Banbridge Non-Subscribing Presbyterian Church is delighted that the choir, led by Master of the Choristers Mr David Stevens, has accepted its invitation to help the congregation celebrate this anniversary. While the First Presbyterian Church was founded 300 years ago, 2016 also marks the 170th anniversary of the opening of the present church building in Downshire Road. The original church was in Lurgan Road, in what is now known as Old Meeting House Green. The congregation worshipped there until 1846, when they moved to the impressive new church. A special 300th anniversary service was held in the church in September. The concert begins at 7.30pm and admission is free. 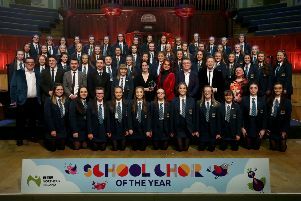 There will be an opportunity to make a voluntary donation to the St Anne’s Cathedral Cross-Community Choir Schools Project which offers free choral singing to schoolchildren from north Belfast, and to the Dean of Belfast’s Black Santa Appeal, now in its 40th year. This is an event not to be missed so be sure to come.